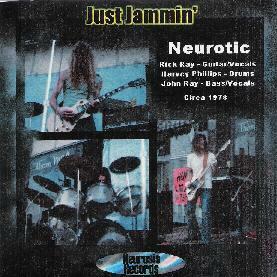 Neurotic - "Just Jammin'" / "Mazy Craniacs"
The very cool and prolific guitar player Rick Ray had a band in the late 70's called Neurotic. These are two archive releases of this intense band from circa 78-79. 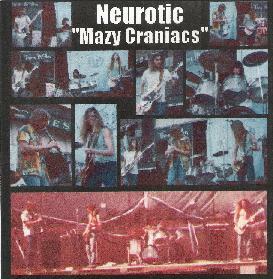 Mazy Craniacs is a studio recording from June 22nd, 1979 and features 8 instrumental tracks between 5 and 6 minutes long with some intense guitar at times. The production is quite raw and not up to the quality of what Rick produces now days, but for 26 years old, it is ok but not that great. Rick was really ripping it up back then as well and I like the phased out guitars on Something a little more Original. Why do the guitars players often want to hide in the sound. Sometimes the guitar is way too buried. A very strange version of the Beatles Walrus is on both CDs. The Just Jammin' CD has a very cool Blue Oyster Cult Medley as well as Black Sabbath Medley. This is a very raw recording from 1978 some of which was recorded at O'Neils house or at the 222nd St. Club House with two microphones direct to reel to reel. While there is some very cool and interesting tracks on both of these CDs the sound quality is not that great and actually after hearing Mazy all the way through, I had quite a strange feeling in my head due to the low fi sound. If you are a fan of Rick Ray, these are worth checking out but otherwise you might want to pass.